Play Pokemon Rocket Strike online with Game Boy Advance browser emulation for free! 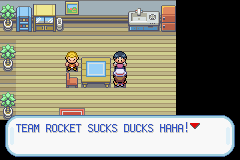 Pokemon Rocket Strike is a rom hack of Pokemon Fire Red (GBA). Play it with our flash, java and rgr plugin emulators. Nothing to configure, we've done it for you! 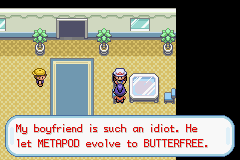 Hey, I'm RocketLeader(best name ever btw since it's true )and this is my first attempt at Pokemon Rom hacking. So please have this in mind as you play this hack that I've tried my best since the idea of being a member of Team Rocket has always fascinated me. I'm still waiting for Game Freak to hire me and grant you to give you what probably everyone of us wants to do. But since I'll need to get my degree at university first I'm on my own for now. -Play on the side of Team Rocket! -Catch over 380 Pokemon, most of them catchable before Pokemon League! -Slight evolution changes for a few Pokemon: For example, Trapinch evolves at Level 30 instead of 35, but Vibrava will evolve at level 50. -Relive Kanto as it should've been(at least for me)with new areas to explore and new challenges awaiting you! -Gen 4 & 5 Pokemon! -Pokemon which acquired special circumstances to evolve(like trading or happiness) will evolve more easily through level up(or evolution stones). -Much humor and many references to real life happenings and characters! Some may like it, some won't, that's only up to you. -Your adventure is far from over after the Pokemon League! -The story has been noticably changed(isn't that obvious anyway?)! 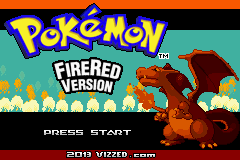 -Difficulty has been increased as I think that the original Firered(and by the way most of the Pokemon games are way too easy)lacks difficulty! -Meet familar faces from other Pokemon games who'll be either friend or foe! Very important: Read this before you play! -Make sure to get the National Pokedex or most of your Pokemon won't evolve! You get the National Pokedex pretty early in the beginning. -Some road blocks will ony vanish if you got the right badge! 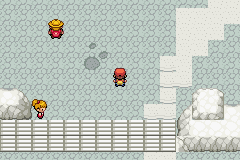 For example the policeman at Route 107 will only disappear if you got 2 badges. After the main story: if you want to continue you need to have captured at least 60 Pokemon! It doesn't matter if they're originally from Kanto or from other regions! So if you like my work I'd kindly ask you to recommend this game to your friends and rate this so I'll get famous...I mean, so that Team Rocket will rule all over the world. Prepare for an epic adventure. 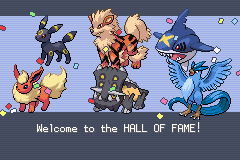 I found this game on pokemonhackersonline and it really caught me, so I came to this site to play it because you can finally play as a Member of Team Rocket, and well I think everyone wanted to play them, just for once. The sound is pretty standard, but I think that's ok because the standard ones are really nice and, why should you change something that is already good. But it would be nice if the romhacker decides to put some other sounds in it. The game can be addictive in some ways, because you play a different role and you are in a completely different situation. The best points on this game is the story. I gave the hack a "10" because I think the idea is really good. I like to play for once the evil ones, who steal Pokemon etc. I also liked that the romhacker put some funny jokes in it. This gave it a nice atmosphere and reminds me a bit of Jessie&James Jokes. The depth is okay. 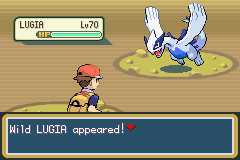 I mean it could be bigger but because it is his first romhack, I think a "7" is suitable. I like the difficulty of the game because I think the normal Pokemon games are way too easy and I like to have the challenge that this game offers. Well and that's it for my review, I recommend you to play this game and give it a try, because it has really good attempts and I hope the romhacker continues on this hack. @Jygin: well, do you expect mercy when you're a criminal? Glad you like it though. @ShadowBird: But do other games on Vizzed work for you? On VisualBoyAdvance Emulator, I get the issue I described below(Yes, I have pressed the A button and reloaded it multiple times with no luck), and on the Mednafen Emulator it says: "The 1M sub-circuit board is not installed." ? @ShadowBird: Wait, what? Are you pressing the A Button lol? Does this happen with other games, too? Maybe you can try out a different emulator. Uh...I can't get past the screen at the beginning of the game that says: "Greetings! This is the HELP system. Call me up whenever and wherever you need by pressing the L or R button, etc." I can't go past it no matter what I do. Can't even play it. @shadowKat: Yes, thats intended. By the way, you can still catch a Squirtle. My Rivel got a normal starter??? 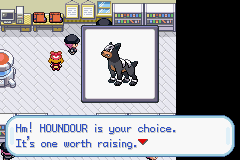 Okay then, but Squirtle is my signature pokemon on first gen based games...though I do love Houndour. @Harukato: Are you playing on Windows with the latest Vizzed Plugin? Unfortunatly i cant play the hack. Even with several plug ins, different browsers and my popup blocker down, nothing works on this site. Sad to say I'll never try this game in the end. 30k plays, Nintendo, you got one pretty big idea here! This hack is listed as Teen because of the language. The language used in this hack isn't different from an official Nintendo game rated as Teen. I'm Sorry but i don't like the language in this game i do not think there should even be language like that in a Pokemon game. Thank you guys, over 20000 played this game so far. I appreciate it! @vovilla: Did you use save states or ingame saves? @Rafl: There is a way. Go to Southport City and then towards the harbor. Surf right, there's another entrance to get back to the SEVII Islands. 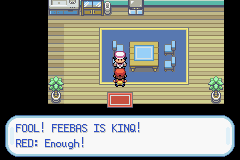 @Rafl: You get it at the same place like in the original Firered, meaning you should get it at the first island in the Sevii Islands. where do you get rock smash ? @lauri: I didn't change any abilities of the starters as far as I know. Mainly because they don't need any changes in my opinion.